Save BMP as PDF in batches automatically. 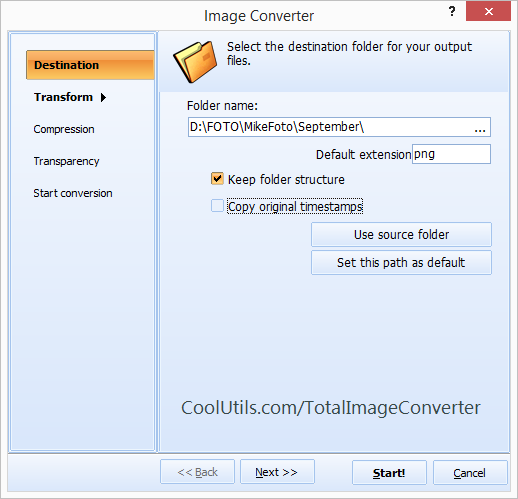 You are here: CoolUtils > Total Image Converter > Save BMP as PDF in batches automatically. Images saved in BMP, or Bitmap, format are characterized by high quality, indeed. However, they are also very large, which makes it barely possible to share BMP files over the Internet. Many users prefer to convert BMP pictures into other formats. As a general rule, JPEG is their first choice. But in certain cases users decide to convert BMP to PDF in batch. Why PDF, you might wonder. PDF is great when it comes to combining several images in one file. 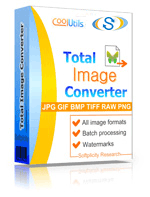 You can easily change BMP format to PDF with the help of Total Image Converter by CoolUtils. This tool is designed specifically for conversion of images and supports batch conversion, which makes it very useful for those who need to process hundreds of files. With CoolUtils batch BMP PDF converter you will only need to select the files you want to convert and set PDF as target format. All the rest will be done automatically! 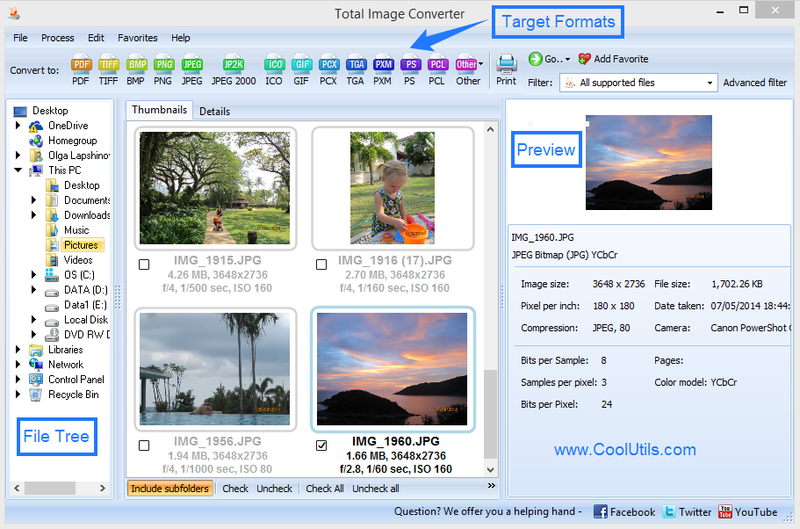 If you are the one who prefers to personalize things, Total Image Converter is also right for you! This tool gives you an opportunity to edit images by cropping, resizing and rotating them both, before and after conversion. It also can be used to add watermarks to BMP files to protect them against unauthorized used. If one day you decide you need more than BMP converter, you will be happy to learn that Total Image Converter can be used to deal with much more than BMP files! It can be used to convert pictures saved in JPG, GIF, BMP, PCX, PNG, TIFF and even various RAW formats. PDF is also not the only target format supported by Total Image Converter. Files can be converted to TIFF, JPEG, RAW, PNG, BMP, PSD, TGA and more. 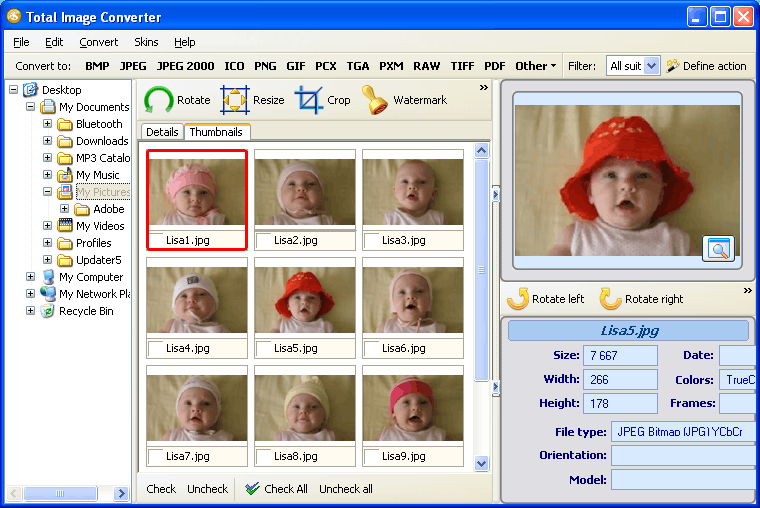 Are you ready to try Total Image Converter? Simply go to the official website of CoolUtils and download a free trial version of the converter and use it for 30 days to see how easy it is to convert BMP to PDF! Convert BMP images to JPEG 2000 with ease! How to convert images from PNG to BMP? Convert BMP to TIFF and get a neat output. Convert BMP to GIF professionally. Resize BMP Images in batches with ease. Crop BMP Images in batches with comfort. Convert PCD to BMP in batches professionally. Convert BMP to PS in batches professionally. Convert BMP to PNG in batches without any problems. Convert BMP to GIF in batches professionally. Convert BMP to PCX professionally. How to convert BMP files to TGA in batch? Get BMP Converter Available in 1 click!